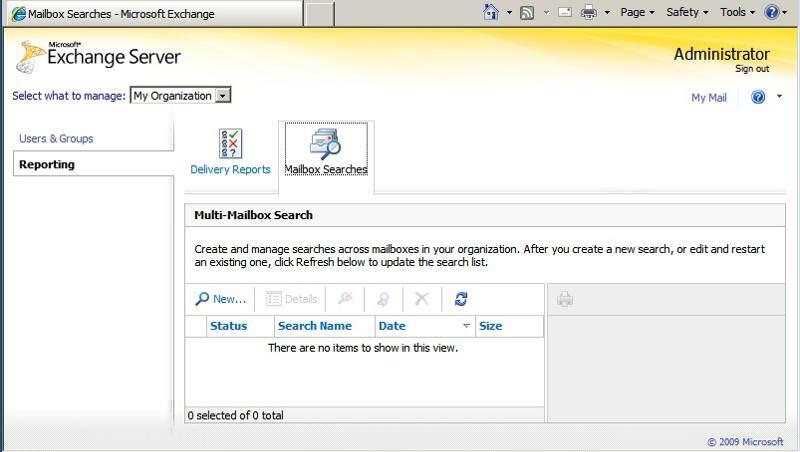 Exchange 2010 introduces an easy, user friendly multi-mailbox search function that is part of the new Exchange Control Panel (ECP). Using Exchange 2010 Role-based Access Control (RBAC) we can very easily give non-technical staff the ability to perform this function without the need to train them on how to use the Exchange Management Shell or 3rd party tools. If your organization adheres to legal discovery requirements (related to organizational policy, compliance, or lawsuits), Exchange Server 2010 Multi-Mailbox Search can help you perform discovery searches for relevant content within Exchange mailboxes. Multi-Mailbox Search leverages the content indexes created by Exchange Search. The Exchange Control Panel (ECP) provides an easy-to-use search interface for non-technical personnel such as legal and compliance officers, records managers, and human resources (HR) professionals. Role-based access control (RBAC) provides the Discovery Management management role group to delegate discovery tasks to non-technical personnel, without the need to provide elevated privileges that may allow a user to make any operational changes to Exchange configuration. Exchange 2010 introduces the Discovery Management Role and the Discovery Search Mailbox. By default no users are members of this role and the user associated with the Discovery Search Mailbox is disabled and it cannot receive e-mail. 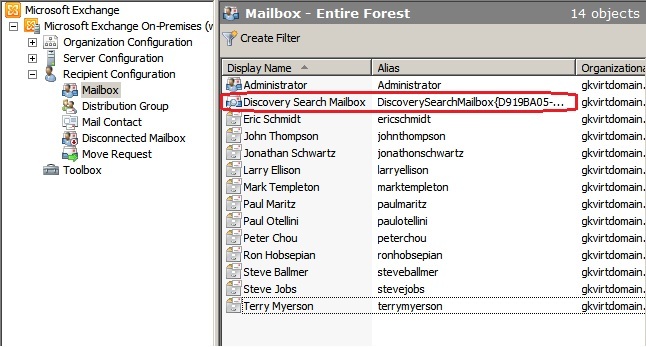 You will find the Discovery Search Mailbox in Exchange Management Console > Recipient Configuration > Mailbox as displayed in the image below. Once users are added to the Discovery Management Role they will gain access to the Discovery Search Mailbox, the multi-mailbox search feature in the ECP and the Multi-Mailbox search cmdlets. Members of the Discovery Management Role also have the ability to put mailboxes and associated archive mailbox into a “legal hold” state. This prevents any deletion or editing of mailbox contents whilst the content is being investigated. Once the user has been added to the Discovery Management role using Outlook Web App and the Exchange Control Panel they will have access to the Reporting section under My Organisation. To gain access to this section from within Outlook Web App click the options link on the top left hand corner within Outlook Web App and then select My Organisation from the "select what to manage" drop down. You will then have the option to select Reporting and Mailbox searches, which will give you the following screen. To perform a search click the New button and then on the screen that appears (pictured below) select the search criteria, give the search a name and specify the Discovery Search Mailbox. Specify to be notified when the search has been completed by e-mail. Once done click Save and the Search will be performed. Once the search has been completed a summary of the search findings will be displayed and if you selected the option, you will receive an e-mail informing you that the search has finished. Search results summary screen below. If you selected to be notified by e-mail when the search has finished there will be a link in the e-mail to open the search results. If you didn’t then you can open the Discovery Search Mailbox by pulling down the arrow in the top right of Outlook Web App next to your name and in the popup box enter "Discovery Search Mailbox" for the name of the mailbox to open and click Open. Once you do this the Discovery Search Mailbox will open and you will see a folder with the name of your search. Under this folder is the name of each mailbox where search results were found, as pictured below.